They’ve had a lot of great models over the years but here are a few that we think are all-time classics… their greatest hits, if you will. Some of these have been constantly tweaked and updated over the years, showing their commitment to “Constant Quality Improvement” which has allowed them to change with the times and stay just as relevant as ever today. These two related models go hand in hand. The Endura and Delica make a good catch-all recommendation. No matter who is asking, we can pretty much say get a Delica or Endura and call it a day. The first reason is that the blade lengths are ideal for EDC. The Delica especially is a size that can be taken almost anywhere and if you need a little extra length you can step up to the Endura. Another thing we love about these two knives (and many other Spyderco knives) is that they can be had in a multitude of bright colors and materials, including our Knife Center Exclusive Pakkawood versions. In a world full of black-handled folders it’s nice to see a pop of color every now and then. 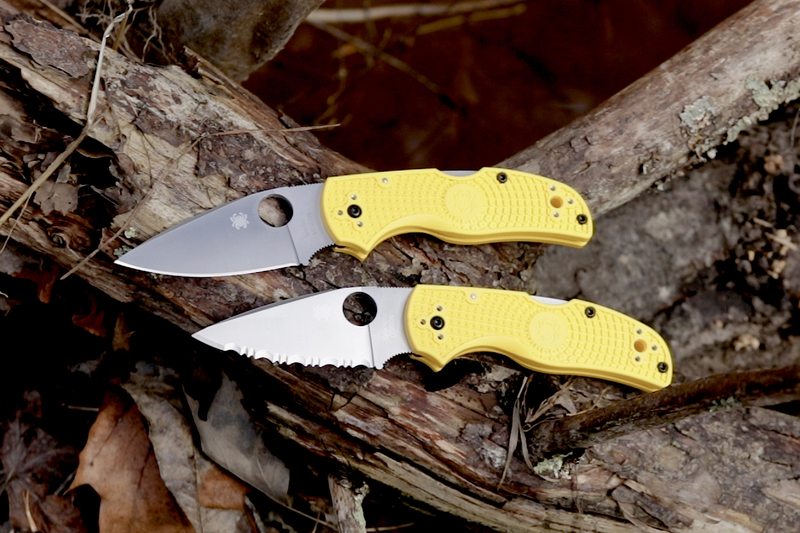 We also love the ambidextrous nature of the Endura and Delica designs. Thanks to those round holes in the blade, no matter which hand you are using, it is a cinch to open. You also get a four-position clip, allowing you to carry it in any pocket you wish, and the center-mounted lock back doesn’t discriminate against lefties. Speaking of the lockback, not only is it sturdy, but the mid-mounted position can help prevent accidental disengagement. This is aided further by the Boye Dent in the lock bar itself, which makes it easy to place your finger in just the right spot and requires a more deliberate press to close than a traditional lockback. 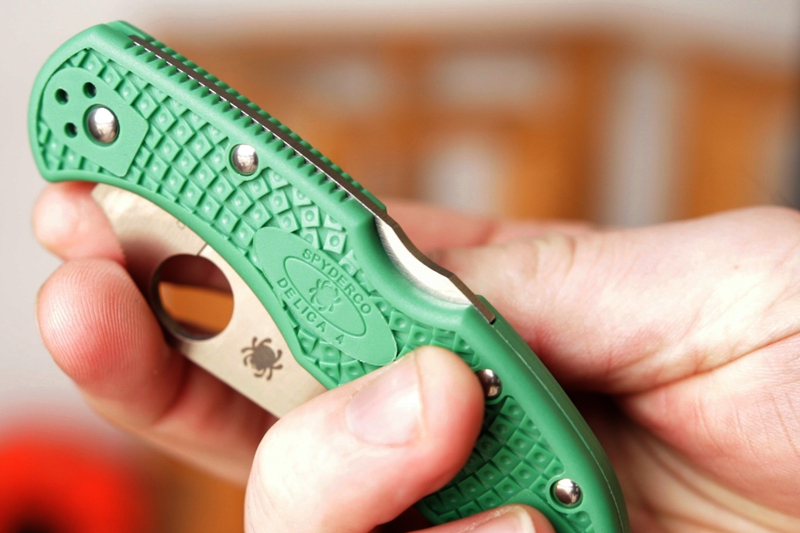 The Spyderco Endura and Delica are both hard working knives at a working man’s budget. They hit a nice sweet spot of price, performance, and ergonomics that make it a daily carry that you always have the confidence to use. The Endura and Delica really do set the mood for what a great Spyderco is and the Dragonfly takes a lot of those same elements and gives them to you in a more compact knife. You’ve heard it all before… bi-directional FRN, Boye Dent lockback, ambidextrous leaf blade… but with a few other elements that have become staples in Spyderco’s design language. Thanks to those additions the Dragonfly really does punch above its weight class. The first new signature is a large finger choil that spans the blade and the handle. Not just meant to be choked up on in specific moments, this is an integral part of the grip. 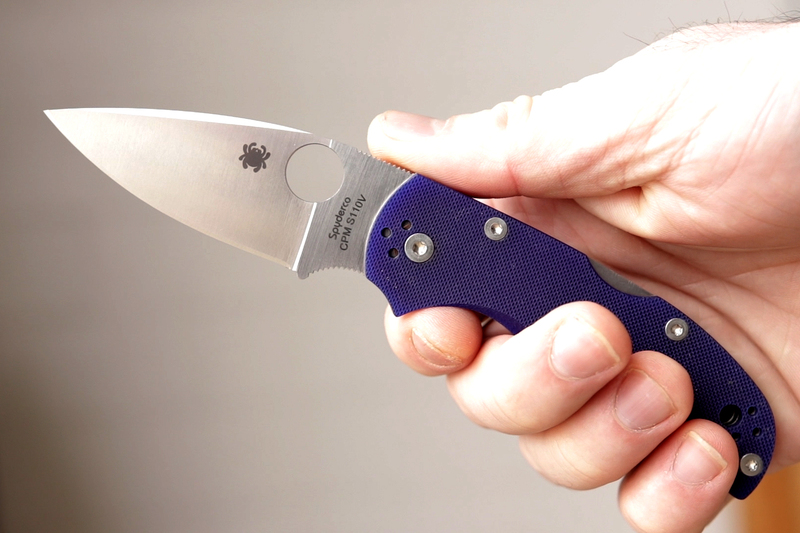 Specifically, on the Dragonfly, this allows you to get a 3-and-a-half finger grip on what is otherwise a very small and pocketable blade. The grip inspires a lot of confidence in use and has made the Dragonfly a favorite of those who chose to carry smaller knives. 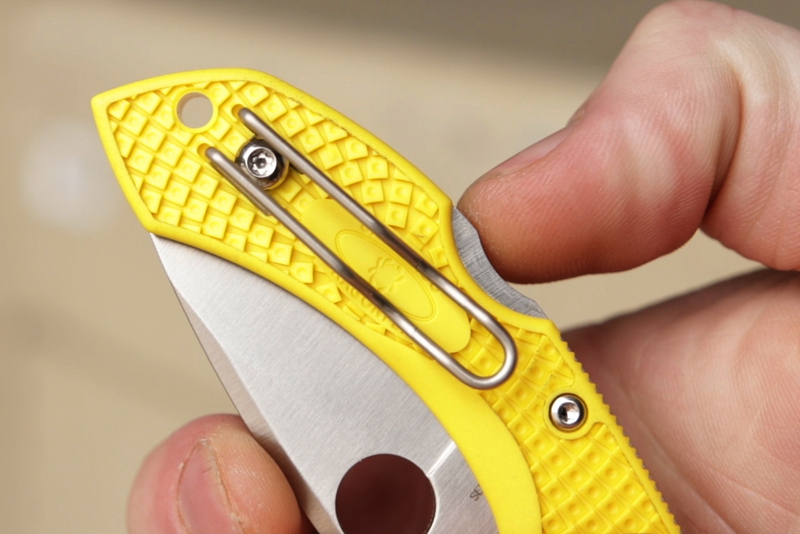 Another feature we see on the Dragonfly that has become an iconic feature on Spyderco knives is the use of a semi-deep carry wire clip that allows the blade to rest unobtrusively in the pocket. 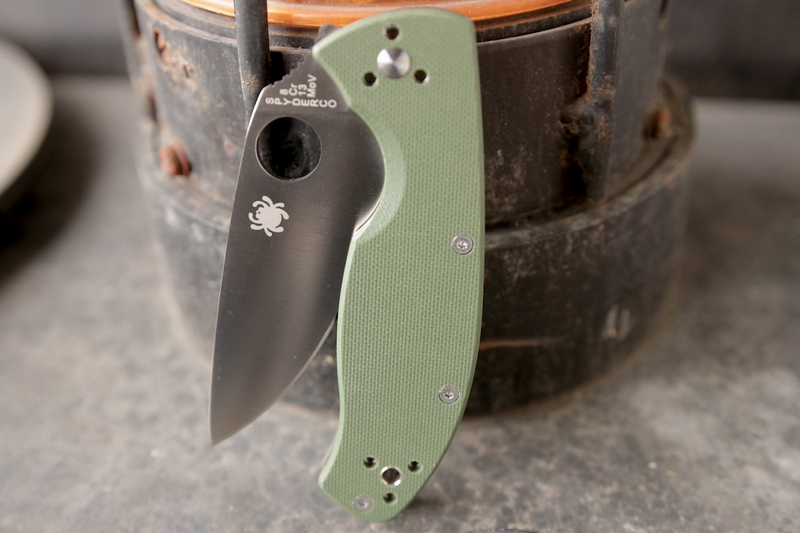 We think the Native 5 is quite possibly Spyderco’s best EDC design of all time. Yes, we know that’s a pretty bold claim, but this knife arranges all of their best notes into a song we will never get tired of hearing. 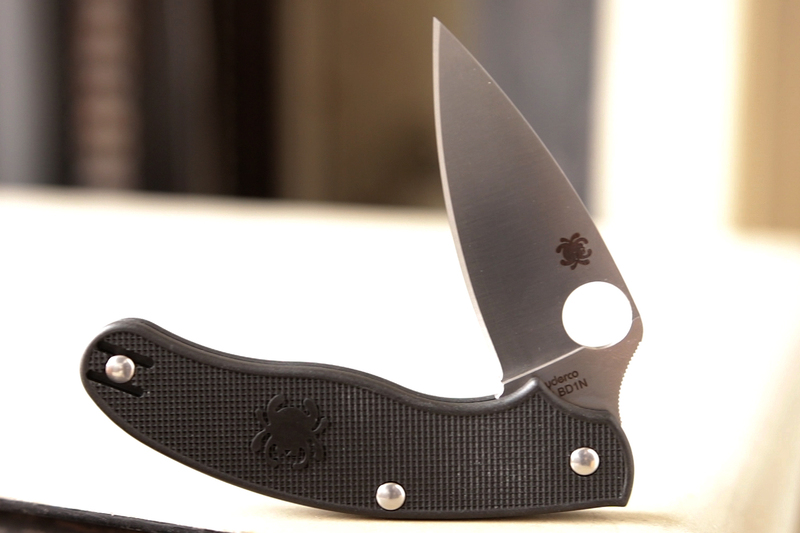 It has a lot of the DNA we saw in the previous Spyderco models such as the sturdy lockback, versatile 4 position clip, excellent cutting geometry, integral finger choil, and adds another thing. 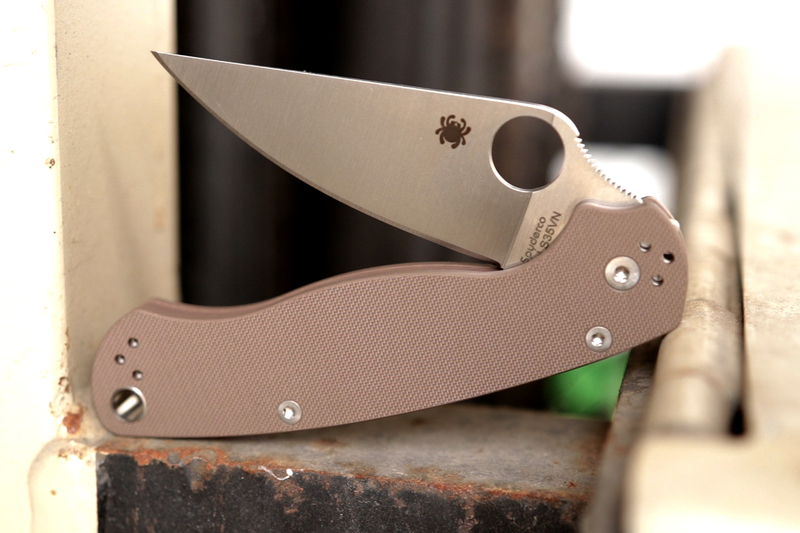 Pushing this over the top is the fact that the Native is made in Golden, Colorado, USA, showing off the precision manufacturing that Spyderco is capable of. A nice touch to this knife is the use of a metal backspacer and full liners, adding rigidity and making this a workhorse of a blade. This knife also runs the gamut with material variations. You can get it in the lightweight FRN as well as heavier duty G10. We’ve also seen versions that use some of the most premium steels on the market, such as their blurple variant that uses heavy-duty S110V and the rustproof Salt edition of this knife featuring LC200N, a highly regarded tool steel valued for its toughness as well as its ability to resist corrosion. Would this be a legitimate greatest hits album if the Paramilitary 2 and Para 3 weren’t on this list? 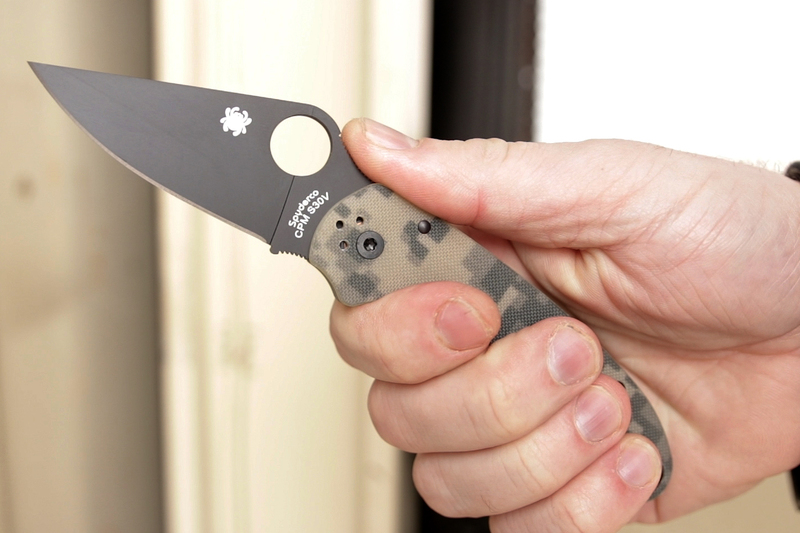 The Paramilitary 2 has been a chart-topper for Spyderco ever since it was released, and the Para 3 takes the same beats and transposes them into a smaller format that still maintains hard use performance. 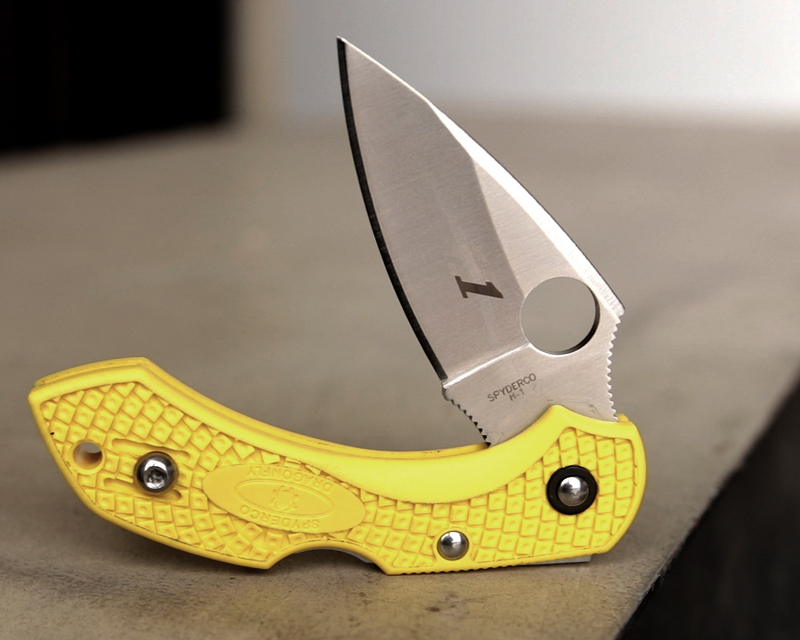 Like the rest of their catalog, Spyderco loves to remix this series as well. These knives have gotten the Blurple/S110V treatment, Earth Brown G10 with S35VN and even Peel Ply Carbon Fiber with 52100 among many other variations. 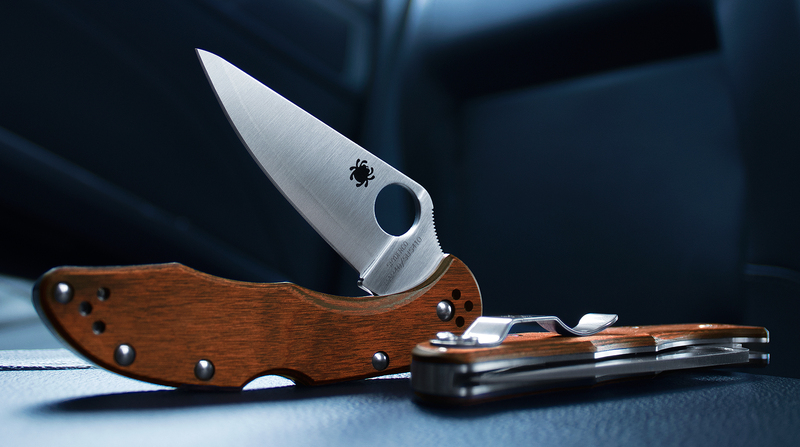 Just like in their early days, Spyderco wasn’t afraid to take a chance on a new style of knife when they launched the UK Penknife. For a company known for pushing the envelope forward, you probably wouldn’t have expected them to throw all of their signature design elements onto a non-locking folder, but the results speak for themselves. With this release they helped legitimize the genre of the one-hand opening slipjoint with modern aesthetics… a genre that continues to grow today. This knife has it all… a truly deep carry wire clip, their iconic leaf shaped blade, excellent edge geometry, and of course you can get them in a selection of materials as well. What really makes this knife stand above others in the genre is the ergonomics. You get a nice 4 finger grip thanks to their signature choil, and since the blade is non-locking, that choil plays a really important role in this knife. When using it, your finger actually acts as a safety keeping the blade from closing while in use. There are a lot of great knives on this list, but the Tenacious shows that no matter what your price range, anyone can enjoy the siren song of great Spyderco designs. This is a knife made in China, and when it first came out it blew people away with the level of fit and finish they were able to achieve at such a good price. Even today it is probably one of our favorite options for a true working blade under the $50 price point. The handle feels great and the high flat grind comes with a little more belly than some of their other designs. The liner lock is made from full skeletonized liners, imparting a lot of strength to this knife. Overall, the Tenacious is just a really well thought out and usable design. One little touch that shows their attention to detail is the edge itself, which comes all the way back to the scales, which combines with the handle shape to eliminate something that many folders suffer from. Usually, there is a dead zone on a folder around the pivot, where it doesn’t function as either handle or blade. The finger choils solve this on other Spyderco’s, but the Tenacious solves the problem in its own way. This allows your hand to get right up behind the edge when working, which is quite nice and sets this knife apart from the crowd. The All-Time Classic Spyderco List. 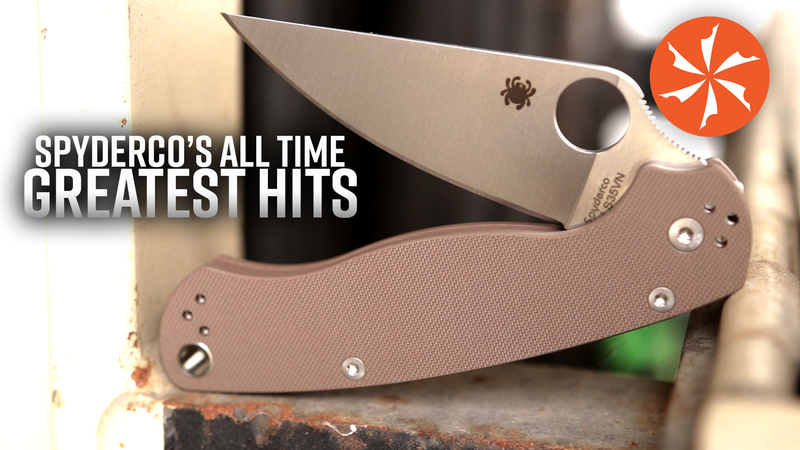 Not only have these knives stood the test of time, earning their place in Spyderco’s hall of fame, but they also happen to be some of our favorites as well.